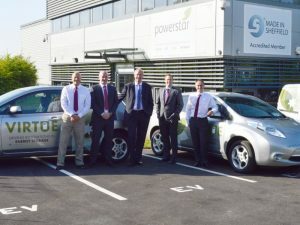 Energy storage specialist Powerstar has deployed four electric vehicles, with aims to convert its entire fleet by 2018. The cars will operate from its base in Sheffield, charged using electricity drawn from Powerstar’s Virtue energy storage unit on site. This can draw energy from the grid at periods of low demand, storing it for use later to avoid usage spikes. Powerstar said it will make the charging points available to visitors, and will also use them to demonstrate the Virtue unit to potential clients. Managing director, Dr. Alex Mardapittas, said, “We are always looking for ways to reduce the company’s carbon emissions and with the development of our own Virtue EV energy storage fast charging system, it was a logical step to invest in a fleet of electric road vehicles.